Kettle Brand certainly keep it simple. And so shall we. Color coded bags. Colors associated with the flavor. Minimalist design. Plain but fairly perfect. While we would ordinarily disapprove of a random graphic on such a minimalist bag, this pepper screams hot and it really is effective. Just to look at these was like staring down a dare - Go on smash into me if you can. It'll hurt!.. The thick brown Chips had a firm and rigid crunch. The oil bubbled surfaces splintered and the smaller Chips creaked before cracking. A more rough and ready looking Chip than most in Kettle's range. They oozed character, along with a little too much oil. An almost dirty look featured golden brown Chips with darker brown areas. There was lots of of skin visible on edges. There were curled and gnarled Chips. There was seasoning aplenty. A great textured Chip. Kettle Brand are very good at putting a flavor out there. A sort of... This is the flavor - you may find better, you may find worse, but this is the flavor, get on with it. And we did. It was a relatively mild to peppery spicy hot Jalapeno taste, but a good, rounded Chip should not burn the insides of your mouth so that you cannot taste the warm, rich potato flavor of the food it accompanies. Otherwise, you could just flavor a chair leg with Jalapeno. 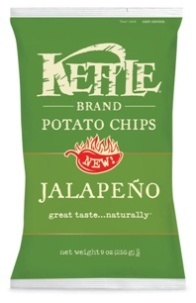 So, while we might prefer a much hotter Chip (we dream of the hot Chip that peels wallpaper off the walls as soon as the bag is opened), this was near on as good a Jalapeno Chip for a mass market as you will find.